Based in Newport, Co Tipperary, O’Malley Coaches is family-run operation which has been servicing the local community and surrounding areas for more than 40 years now. Irish Trucker learned more from its Managing Director Edward O’Malley recently. Four decades on the road now and the O’Malley clan down in Co Tipperary are going as strong as ever with their excellent bus fleet now up to 18. Company director Edward O’Malley, who is its second generation owner, wouldn’t have it any other way, having started working in his father’s business when he was just 16 years old. Since that time, O’Malley Coaches has amassed a glowing reputation for its punctuality, competitive prices and a quite excellent customer service. Despite his busy schedule this time of year, Edward himself was able to take some time and give Irish Trucker the lowdown on this successful family business. “We’re based in Newport, Co Tipperary and we are on the go here since the 1960s,” he outlined. “At the moment we have 17 staff and my wife (Teresa) and daughter (Jean) are with the company here as well. O’Malley Coaches’ College Commuter service caters for students travelling from the University of Limerick, Limerick Institute of Technology and the Mary Immaculate College every weekend to Athlone and back to Limerick on Sunday in time for class on Monday morning. The company’s Coach Hire service caters for wedding parties, as well as stag and hen parties ahead of the big day and, as aforementioned, the O’Malleys look after school tours and sporting events along with a wide range of different services. One thing you can be certain of is O’Malley Coaches being there for you, on time, when you need them. It’s part of the reason why they’ve had such long-standing success – back from the time when Edmund O’Malley was first building up the operation down in Foildarrig, which is located just eight miles from Limerick city. “The business was started by my father Edmund O’Malley. He actually started with a car and then bought his first bus and grew it from there,” said Edward. Another string in the company’s bow is the fact that it offers its customers a comprehensive coach hire service to cater for a multitude of requirements as specified by each individual’s needs. After more than four years in the business, the O’Malleys have certainly learned plenty from their customers and are there to provide you with a service which is completely hassle free, as well as competitively priced to give peace of mind no matter where you or your group are going. O’Malley Coaches’ friendly and professional drivers are there to guide you to and from your destination with experience and punctuality. As a family business, they take pride in leaving customers satisfied with their journey every time, so if you’re booking a group trip for a sporting event or you need to move a wedding party form the church to the hotel, call O’Malley Coaches now for a free quote. Recently, the company added a brand new coach to its impressive fleet and Edward revealed that they’ll be bumping the count up to 19 and at the beginning of next year. “We bought a new Higer Storm coach from Harris Commercials three months ago,” he stated. Many of the coaches at O’Malley are equipped with air conditioning, reclining seats and TV Audio equipment while all of them are modern and well maintained for maximum comfort on the passenger’s journey. Overall the picture is very bright for this 40-year-old company as it continues to move in the right direction by staying busy and adding to its fleet year on year. Edward is very much intent on keeping things that way by continuing to keep passengers satisfied all year round. “It’s a bit of a struggle to get new drivers, to be honest. We have great drivers here but finding new ones up to that standard now is quite tough,” Edward explained. Going on form, Edward and Co are sure to attract some new drivers up to the specification somewhere down the line, given the fact that they have so many currently within their ranks. 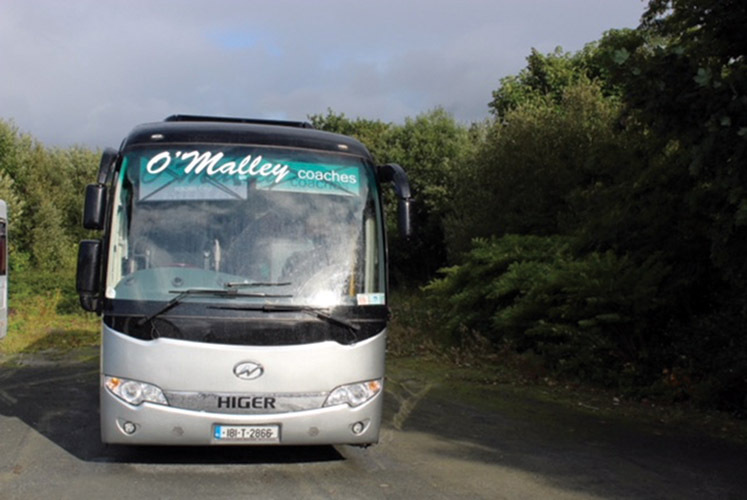 Nonetheless, you can be sure that O’Malley Coaches will keep on doing what they do – deliver an excellent service to its customers all throughout Ireland time and time again. According to Edward, it’s what separates them from much of the competition and continues to be a key part of the reason why so many of their clients choose them first. “We’ve always given a good and dependable service here down through the years and it’s going to stay that way,” Edward concluded.